As part of our Pacific Seas Aquarium Community Celebration this April, we’re filling every Friday with art! 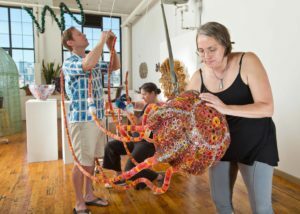 April 5: Kait Rhoads – Jellies! Kait Rhoads working on the glass jellyfish in her Seattle studio. Seattle artist Kait Rhoads made the three enormous glass jellyfish hanging near Baja Bay by blowing and cutting glass hexagons, then weaving them onto steel “tentacles”. Meet Kait and the people who helped her, including Tacoma’s Hilltop Artists and the Museum of Glass. Then make your own glass bead jellyfish, design a possible glass artwork for the Museum of Glass Hot Shop to make, and find out about our real jellies. Kids playing in “Shimmer,” art by Gordon Huether. Join Pacific Seas Aquarium artist Gordon Huether as he collaborates with local scientists to talk about how humans perceive light – and how that helps him create astonishing public art works like “Shoal” and “Shimmer.” Also on the Art+Sci program: Dr. Peter Wimberger, UPS biologist, on the evolutionary ecology of fish schooling, color and vision; plus UPS neuroscientist Dr. Siddarth Ramakrishnan on how our brains “see” color. April 12: Gordon Huether – Shimmer! 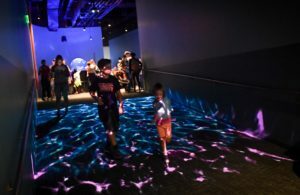 California artist Gordon Huether was inspired to create his light art installation “Shimmer” by the actual shimmer of light on water in our old North Pacific Aquarium. 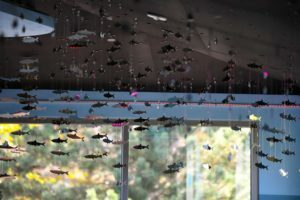 Schooling herring, like the ones in the aquarium, inspired his metal installation “Shoal.” Meet Gordon and hear how he creates his work. Then make your own “Shimmer” dance video – tag us if you upload! – or fish artwork. April 19: Maria Jost, Seascape! Maria Jost near her watercolor mural at the Tidal Touch Zone. 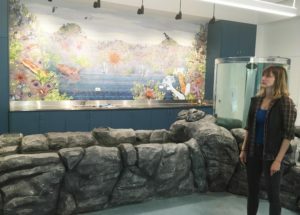 Tacoma artist and scientist Maria Jost created the delicate seascape mural behind the Tidal Touch Zone by studying Puget Sound beach life, painting intricate watercolor panels, then combining everything into a digital mural. Meet Maria and paint your own watercolor with the help of Maria’s students from the Science and Math Institute, a high school with a campus right here at the Zoo. Green sea turtles are an endangered species protected by the ESA. The ocean is facing problems – but together we can make a wave of change. Join hundreds of Tacomans to make a community art “wave” of paper turtles, each with your pledge to protect the ocean. “Waves” from Eastside, People’s and STAR community centers will join the Zoo’s in a floating testament to how Tacoma cares for the ocean. 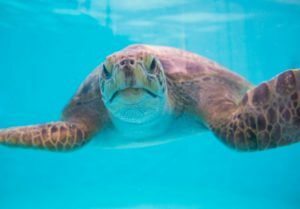 Each turtle will earn $2 towards ocean conservation, thanks to the Ocean Art Challenge and the Bezos Family Foundation.